PO2 Patrick W. Menah Jr.
An MV-22 Osprey from Marine Medium Tiltrotor Squadron (VMM) 166 approaches for a touch-and-go landing on the flight deck of the aircraft carrier USS Carl Vinson (CVN 70). Carl Vinson is underway conducting Precision Approach Landing System (PALS) and flight deck certifications. 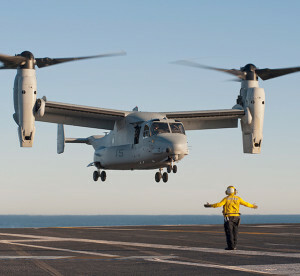 The V-22 is being tested and evaluated as it is scheduled to become the singular logistics platform on an aircraft carrier for future carrier on-board delivery operations. Since the Osprey is still a new platform for aircraft carriers, there were some things the flight deck crew had to be mindful of. The operation proved to be a valuable training opportunity for Carl Vinson Sailors on the flight deck. Matthias added that day-to-day training and proper preparation are essential to make Air Department sailors ready to handle anything that may come across the deck. Hart went on to say that with the ability to take off and land like a helicopter, the Osprey is a valuable asset to both the Navy and Marine Corps. It possesses the speed, range and carrying capability of an airplane, but also offers the versatility and flexibility to land places that require neither runways or arresting wires. Carl Vinson is currently underway conducting command assessment of readiness and training (CARAT) II off the coast of Southern California.